Our April 2016 bird in the 12 Months of Birding at the Inn blog series, the Yellow-rumped Warbler, is a bird best seen during spring and fall migrations, although some have been noticed while wintering here in Pisgah National Forest around Asheville, NC. The Yellow-rumped Warbler is on the larger end of the warbler size spectrum. There are actually two subspecies of Yellow-rumped Warbler, and the one we see here in the eastern United States is known as the “Myrtle” version. It has a white throat, which sets it apart from its western United States counterpart with a yellow throat (the “Audubon’s” version). The “Myrtle” warbler’s body is streaked in dark gray and white and it has a bright yellow crown on the top of its head as well as its namesake yellow rump. It also has a black Zorro-esque mask around its eyes. The Yellow-rumped warbler loves eating berries in the fall and winter months. 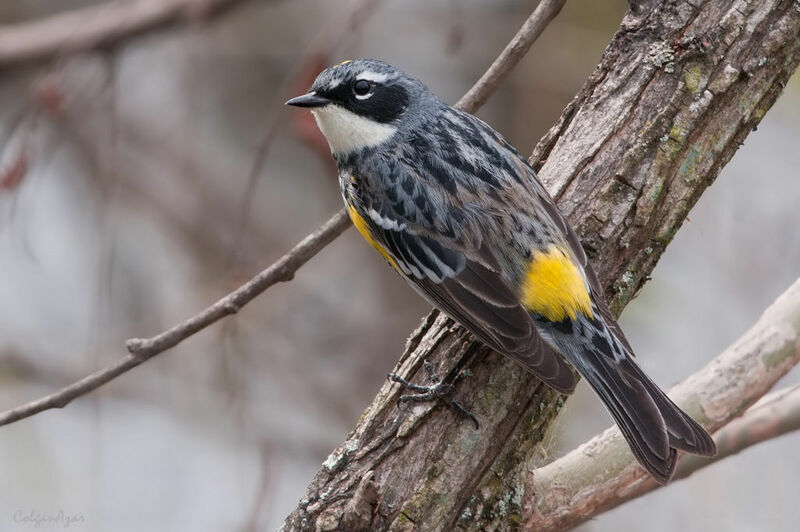 Here’s a fun fact from the Cornell Lab of Ornithology: The Yellow-rumped warbler can spend its winter further north than a lot of its fellow warblers because it can digest the wax off of bayberries and other plants. Insects are a big part of the Yellow-rumped warbler’s diet, and is an active little hunter, able to catch its dinner in midair. And spiders, watch out, because the Yellow-rumped Warbler will go right up and pluck your catch right off your web. Like the guy who eats everyone else’s lunch out of the refrigerator at work. They also like seeds, including goldenrod and sunflower, and we will occasionally see them at the bird feeders helping themselves to yummy sunflower seeds.